The discernible chill in the air and the abundance of scarlet, golden yellow, and fiery orange on the trees signifies that fall has truly arrived. This means shorter days, colder nights, and lots and lots of delicious autumn squash! This stuffed acorn squash recipe is extremely easy to make and requires very little prep. 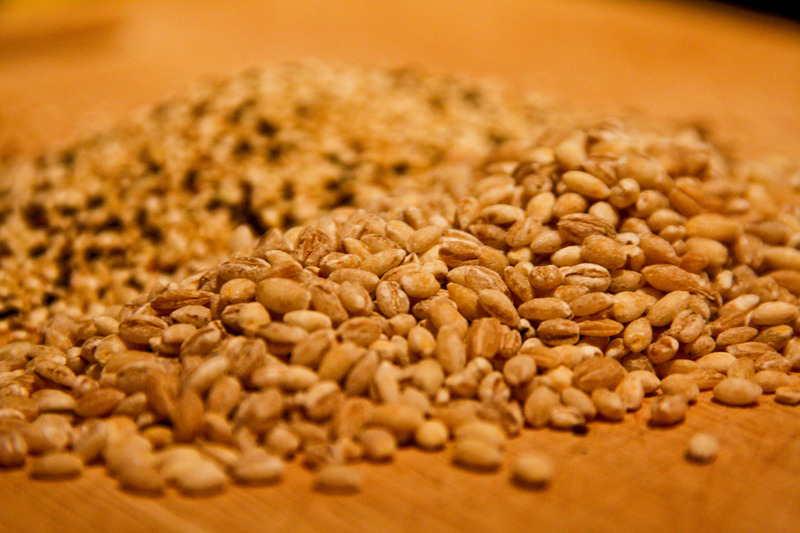 It’s also vegetarian and uses two of my favorite grains – quinoa and barley. I actually adapted this recipe from one that I found in Martha Stewart’s Whole Living magazine. I love the combination of quinoa and barley because you get the best of both worlds – the flavor and texture of quinoa married with the yummy nuttiness of barley. 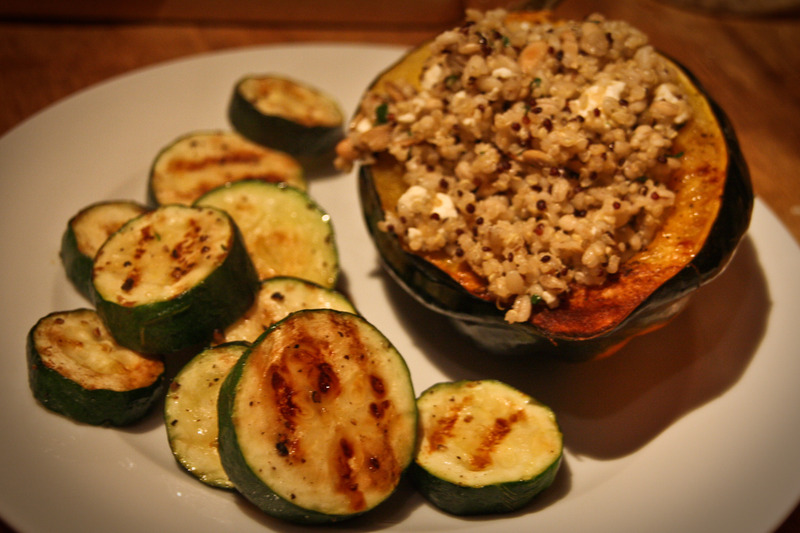 The stuffed squash recipe was featured as a healthy side; however, I think it makes a terrific, easy, weekday main dish. 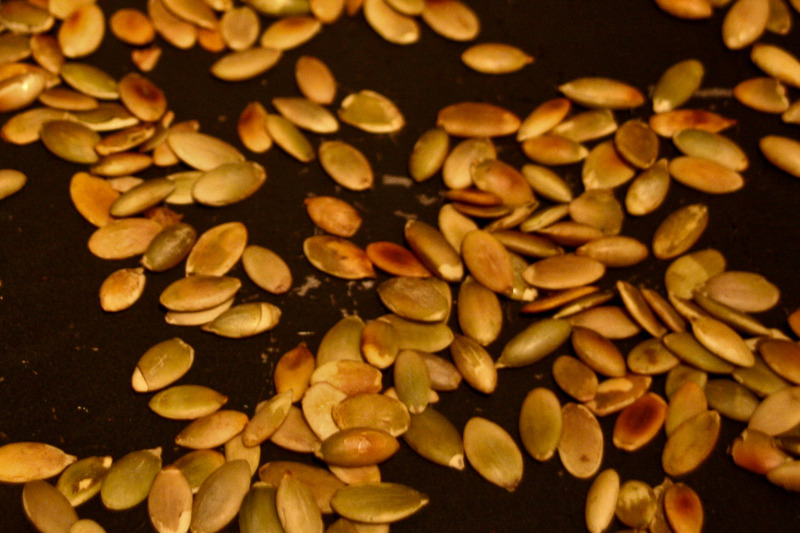 Toasting the pumpkin seeds takes just a few minutes over medium heat, and it really brings out their flavor and crunch. You could substitute pumpkin seeds (pepitas) for chopped walnuts, pine nuts, or pistachios – whichever you prefer and happen to have on hand! 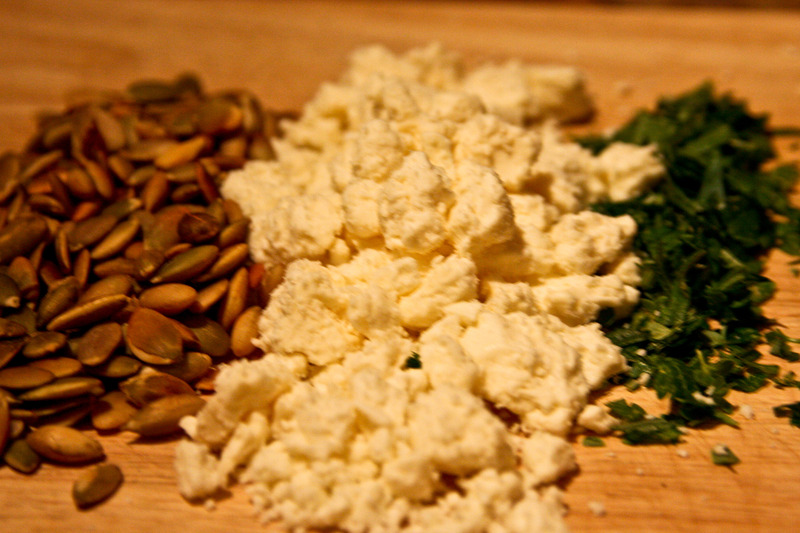 Creamy feta cheese, the toasted pumpkin seeds, and fresh chopped herbs give the stuffing a great flavor. 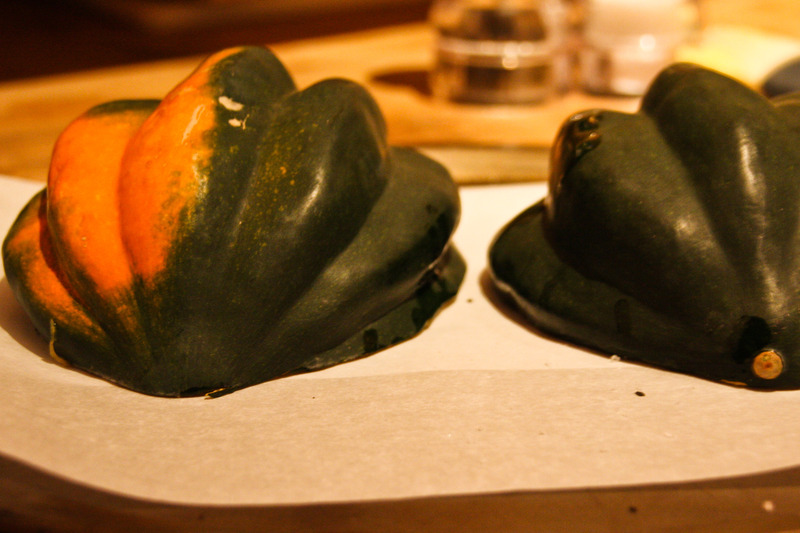 I served the stuffed squash with grilled zucchini. You could serve it as a side dish for your favorite chicken or pork (or tofu! ), or make a mixed green salad to go along side it. 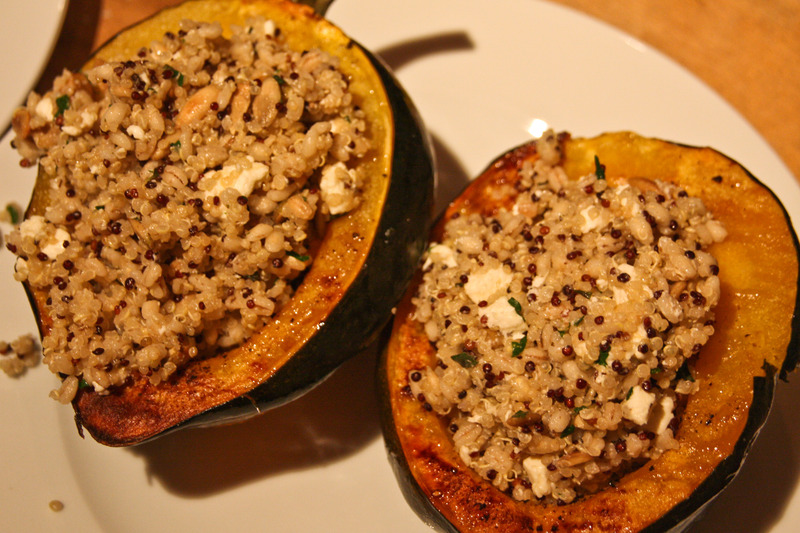 The recipe below makes four servings of the quinoa-barley mixture (enough to fill two roasted acorn squash, halved). 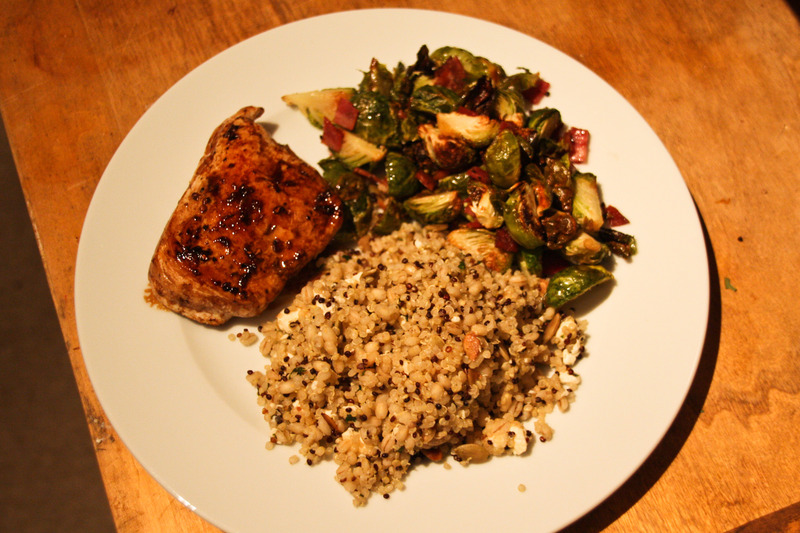 If you prefer to only make two servings of the stuffed squash at a time, you can use the leftover quinoa-barley mix as a side dish for another dinner, as I did below with roasted brussels sprouts with turkey bacon and balsamic chicken – recipes to be posted soon! Preheat oven to 400°F. 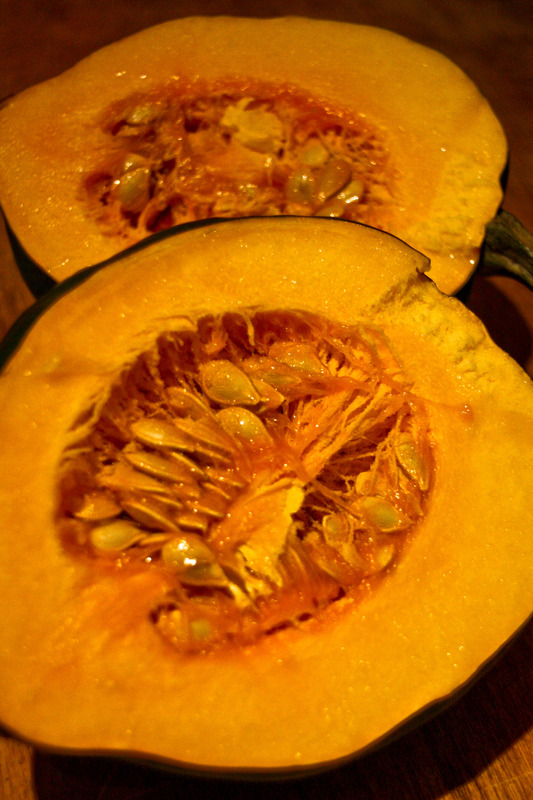 Brush (or drizzle) each squash half with a little olive oil and sprinkle with salt and pepper. 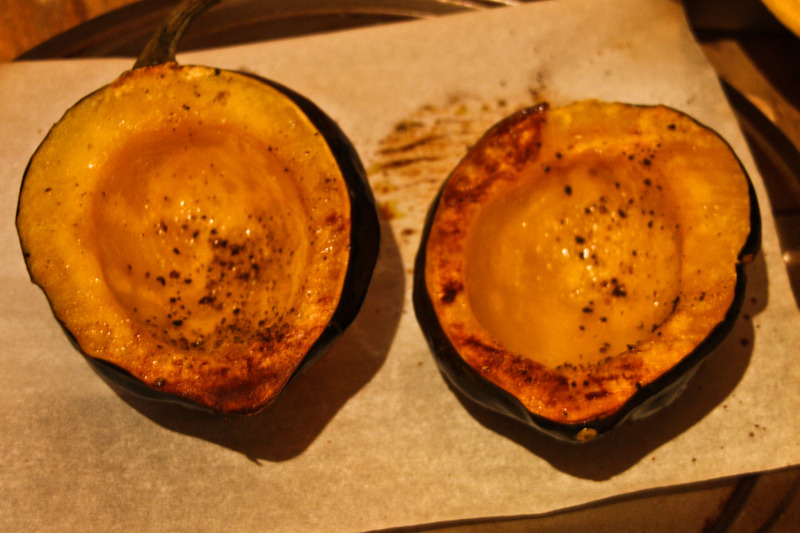 Place squash halves cut side down on a baking sheet, preferably lined with parchment paper, and bake for about 20 minutes, until tender. Meanwhile, bring 2 1/2 c water to boil in a medium saucepan. Add quinoa and barley to boiling water, reduce heat, cover and simmer for about 20 minutes or until water is absorbed and grains are tender. Toast pepitas (or other nuts) in a small sauté pan over medium heat for just a few minutes, until golden brown. Mix cooked quinoa and barley, pepitas, herbs and feta cheese together in a bowl. Drizzle with a little more olive oil, add salt and pepper to taste, and stir once again. Fill each half squash with approximately 1/2 c of quinoa mixture. Serve warm and enjoy!